This Wisconsin Thematic Panels gallery is a collection of nearly 100 panels containing almost 800 images gathered from collections at the Wisconsin Historical Society. 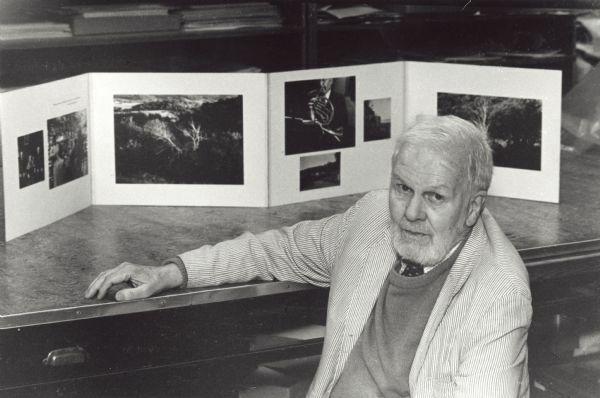 Included on each panel is at least one of Vanderbilt’s own landscape photographs and a short poem by him that attempts to guide the viewer to a personal understanding of the panel as a whole. See 96 "thematic panels" that combine historical photographs, photographs by Vanderbilt and Vanderbilt's poetry. View the catalog listing for Vanderbilt’s personal papers. View the catalog listing for the records of Vanderbilt’s Wisconsin Thematic Panels project. Listen to audio recordings of Vanderbilt’s conversations with staff at the Wisconsin Historical Society, writers, professors and students. Paul Vanderbilt reads an essay describing the Wisconsin Thematic Panels Project that he wrote and presented at an Advanced Studies Workshop, George Eastman House, Rochester, New York, 1967. Explore the online collection of 96 thematic panels containing almost 800 images gathered from collections at the Wisconsin Historical Society. Read a historical essay on Paul Vanderbilt, one of the country's most respected scholars in the field of photography and archives.